Summertime is on the horizon, and what better way to spend your L.A. summer nights than with the sights and sounds at the Hollywood Bowl? As the official rideshare partner of the Hollywood Bowl, Lyft is here to make your night sing, and get you to and from the show! 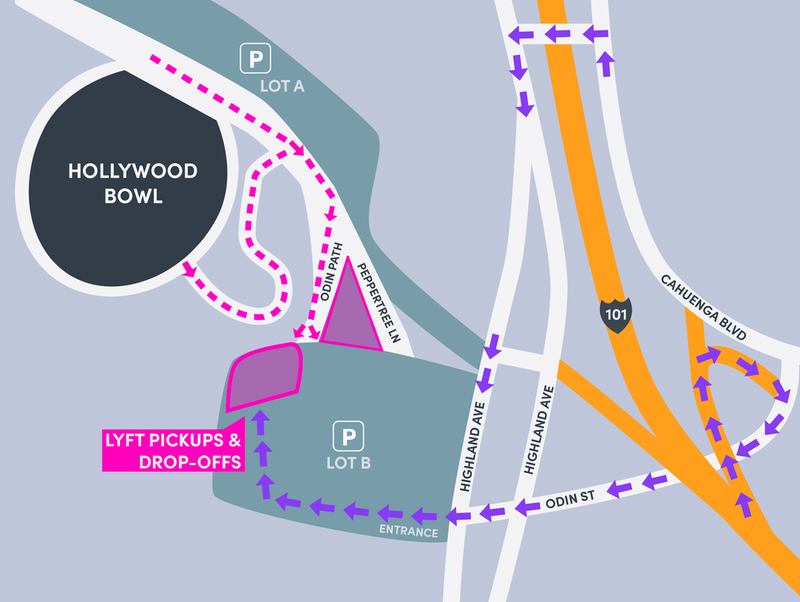 With our new easy-to-navigate pickup and drop-off spots, located in Lot B of the Hollywood Bowl, arriving and departing in style has never been easier (or more fun!). As you leave your seat and start heading down the hill, make a sharp right onto Odin Path to head to the Lyft pickup/drop-off area. You’ll know to take a sharp right—we’ll have glowing pink signs! On your way down the Odin Path you’ll see our Lyft Lounge on your left. Stop by as you wait for your ride to charge your phone and help yourselves to our designated WiFi for better connection on your Lyft app only. Once your ride is in Lot B, head to the Lyft/Rideshare staging area, and a friendly staff member will help you connect with your driver. Note: the pink dashes mark the passenger's route to the Lyft Lounge/pickup area. The purple arrows signify your driver’s route. Make sure to keep your eyes out for additional Live Nation shows that Lyft will be sponsoring this concert season. We look forward to seeing you at the Hollywood Bowl!